My Wandering Life: I Louvre You. Remember how I mentioned that the Mona Lisa is just a tiny painting? 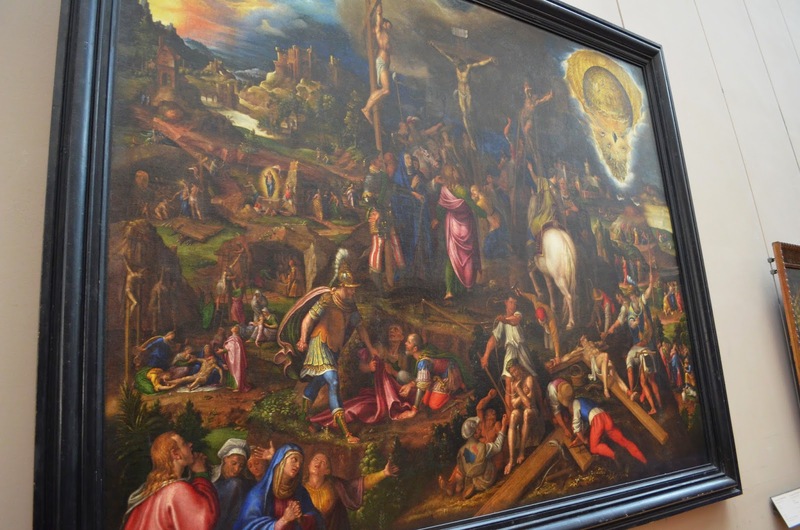 The curators decided to balance her petite frame by facing her with one of the largest paintings in the Italian wing, Antonio Campi's The Mystery of the Passion of Christ. In the top right corner there is a controversial image of what many people think is a planet or UFO. When looking it up, I found all sorts of conspiracy theories about it. I'm sure the Mona Lisa has plenty of time to ponder the Mystery while the museum is closed! 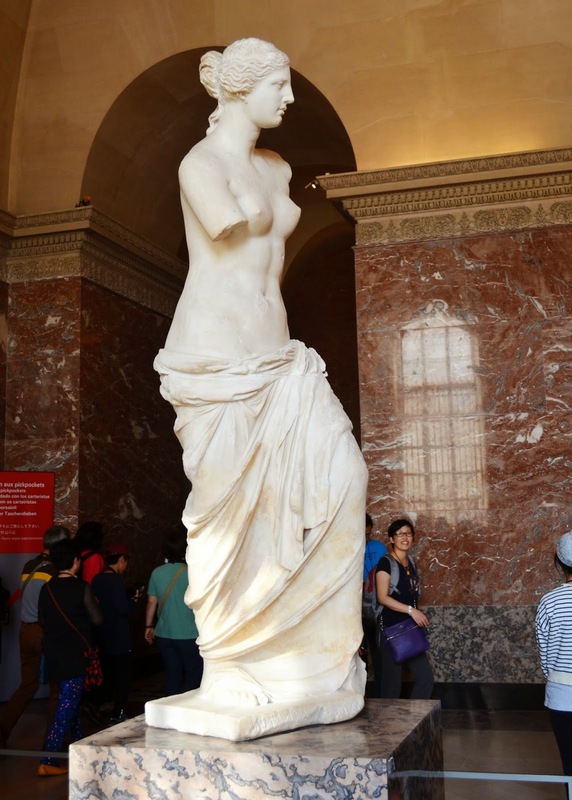 Following our rendezvous with La Gioconda, we consulted our map to seek out another famous lady, Aphrodite, who is better known as the Venus de Milo. 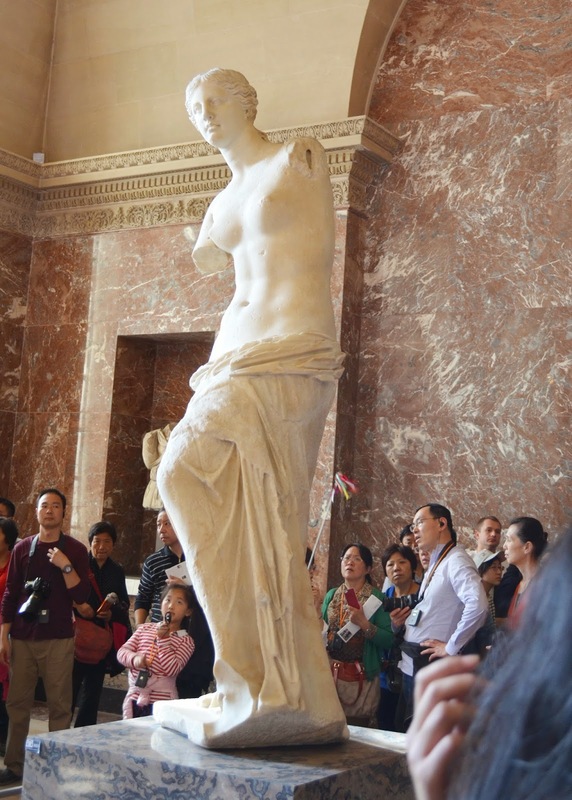 We walked through a lot of marble statuary to find her, and arrived right as a huge number of tour groups converged on the scene. This time we patiently waited it out, as the tour groups were just interested in checking it off their list before moving on. Not much different from what we were doing, to be honest, but considering we were looking at a sculpture that's been around as long as the Great Wall of China, we thought we'd spend a few moments just gazing in awe. 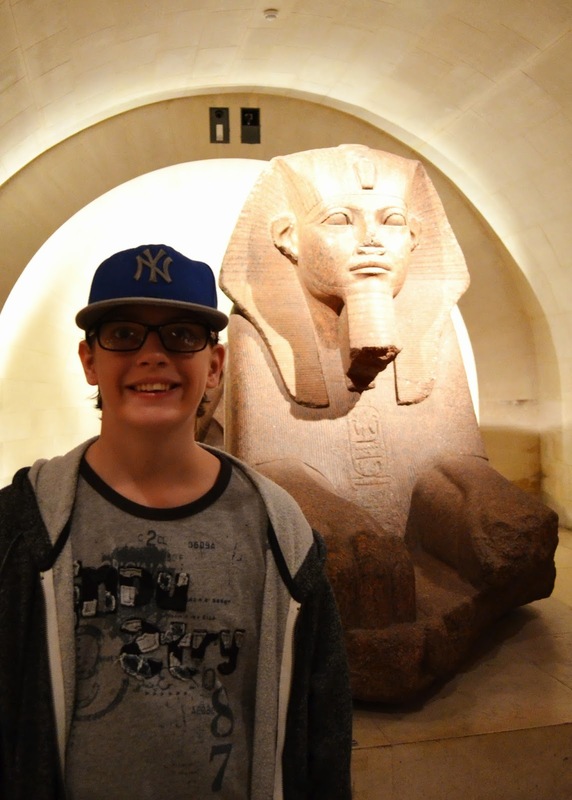 But then it was time to see the sphinx. The Great Sphinx of Tanis to be exact. I'd read that this is the largest sphinx housed outside of Egypt. Since we've not yet been to Egypt, I thought it was going to be quite large. It was actually no bigger than a minivan. But it dates back to 2600 BC, so we won't disparage it's size because its age inspires serious awe. Nathan was quite happy! 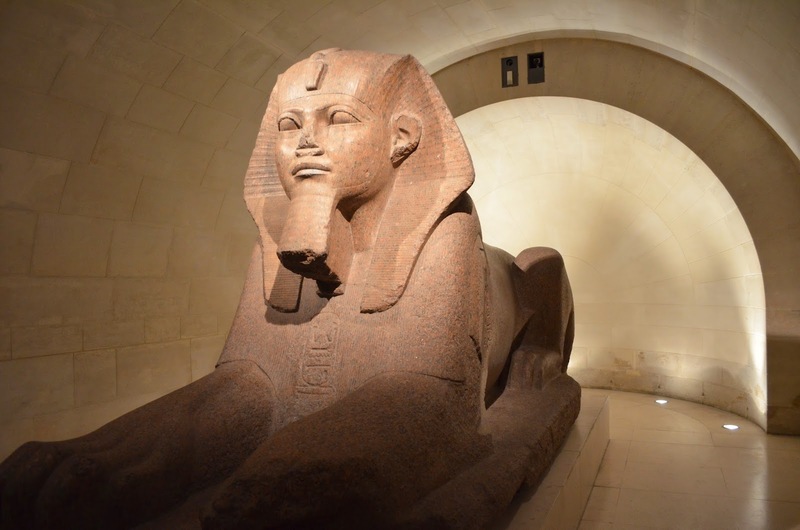 Fun fact: when the Great Sphinx became part of the collection at the Louvre around 1853, there was not yet the machinery to lift and move it's hulking 26 ton weight. 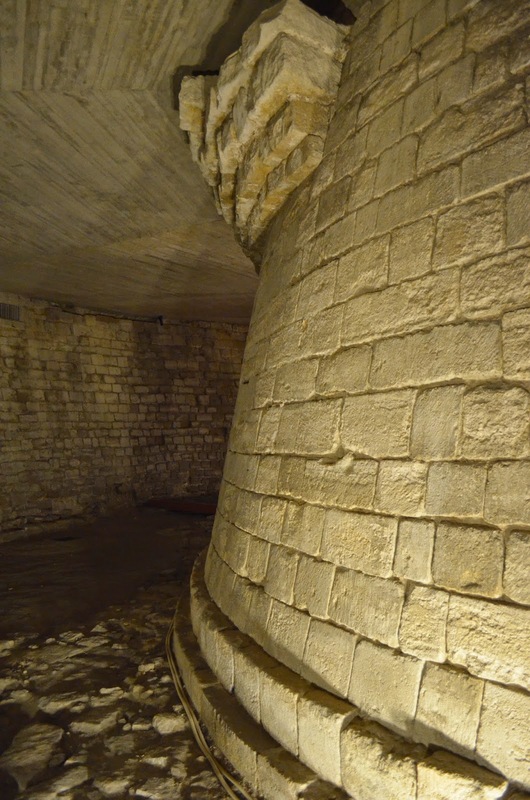 So to get it into place, they tore a hole in the side of the Louvre and then pushed and pulled it into place, and then patched up the hole again. 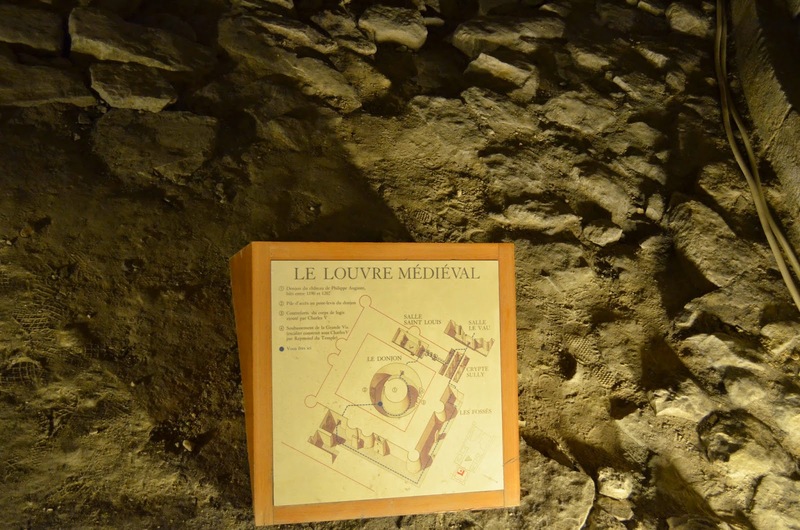 Our last stop was Ben's choice, down into the deepest subterranean parts of the Louvre to find the ancient medieval moat which was the original construction on the site back in the 1100's. I'm not gonna lie, I was so happy Ben chose this to see. It was dark and freezing cold down there, and I was having massive hot flashes as we raced around the enormous museum. Michael and the boys shivered while I stood against a large air con vent, sighing contentedly. Here is the bare dirt floor where the moat once was long ago. We stood on a suspended catwalk, looking down at the sign. Seeing the tennis shoe imprints in the dirt was disappointing. Surely knights didn't wear Nikes when the moat was drained? And here is the remains of a corner of the original fortress, which stood from 1202 until 1546 when King Francis I decided he wanted bigger digs. Every monarch since then added on a bit until 1789 when it became a museum full time and ceased to be a seat of power for the government. Sometimes we see something like this and don't really think about it. But as I paused in that blessed stream of icy cold air, I realized that the bricks I was looking at have been sitting there, nestled together, for over eight hundred years. The country of my birth is less than 250 years old. Its history is just a blip compared to just about everything we saw in both London and Paris. It gave me a different perspective on some of the struggles going on in America right now. We're really still in our infancy, aren't we? 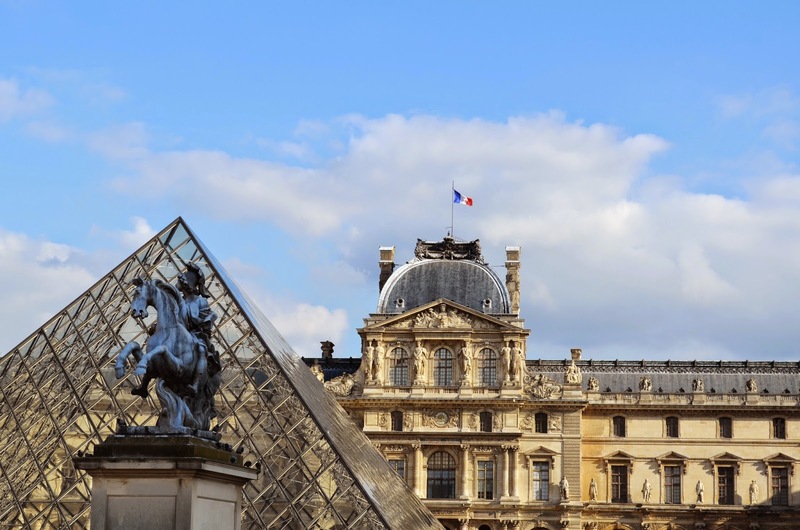 After completing our circuit of the four things we absolutely had to see, we left the museum and headed for the next stop on our speed tour of Paris. We stopped for gelato at a small cart in the courtyard, and I could not help but turn back and look at the beautiful Louvre, with the French flag flying in the breeze. There's really no doubt in my mind that I'll be back again some day. But I fear it will never be as perfect or magical as this first trip, fast as it was.